Billed as the revolutionary way to communicate with your baby from birth this little book has a lot to live up too. First impressions were good. The cover has a mum and baby smiling delightedly at each other, also there are many illustrations and just 130 pages. What new mum needs to wade through over serious wordy and long text books! Released tomorrow this book shows you Vivien Sabel’s technique to understanding the language of a baby and the ability to talk back to your baby so your baby feels understood. 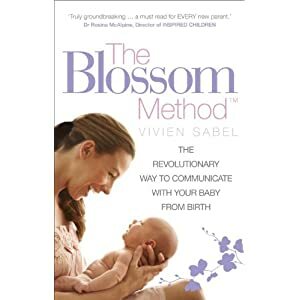 Vivien Sabel had a non-signing, deaf mother which hugely influenced her appreciation for the subtleties of non-verbal communication .Vivien’s own daughter is called Blossom and has been another huge inspiration. The technique is all about developing your bond with your baby and helping them become happier and more settled as you understand and respond to their needs. I was not at all surprised to read that Vivien was a relational psychotherapist and fluent in BSL., I am a person centred psychotherapist and I used to be a baby signing teacher. We have a lot in common which is perhaps why I ABSOLUTLY LOVE this book. The importance of picking up on small gestures and cues, reflecting, mirroring, and observing are all essential to communication and Vivien explores this isn depth and in action. Non verbal communication is hugely important, a baby communicates with you all the time you can learn to read them, case studies demonstrate Vivien’ds method at work. Vivien looks at tongue talking and describes how babies tongues do a lot of talking through positioning and through speed of movement, etc. A soft rounded tongue centred in and out indicates, for example, that a baby is very hungry. I won’t reveal Vivien’s methods for you, you have to to read it yourself but this book is about being attentive without being in control. It is about showing understanding not rushing to meet each and every need. It’s about knowing what leg kicks mean, and many other gestures. It’s so very helpful.